A perfect first knitted or crocheted project is a Warm Up America! afghan section, a 7" by 9" rectangle, which can be joined with others to complete a blanket and then donated. From such basic rectangle or square shapes, you can create any number of fun projects. Take that same Warm Up America rectangle, fold it in half, sew up the bottom and side and you can make a case for your cell phone. If you have a small iPod or MP3 player, make a smaller rectangle. If a 7" by 9" project is a too ambitious and time-consuming project, consider a long skinny rectangle, which could make an ideal bookmark. 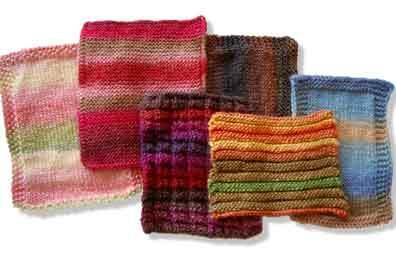 Larger rectangles and squares make great looking hats, bags, or animals, and if you keep on knitting or crocheting you can design a cozy wrap, shawl or throw. The design options are limitless and check out the projects below!